View TMX (Translation Memory Exchange) files (beta). Is there a better alternative to Xoterm? Is Xoterm really the best app in Word Processing category? Will Xoterm work good on macOS 10.13.4? 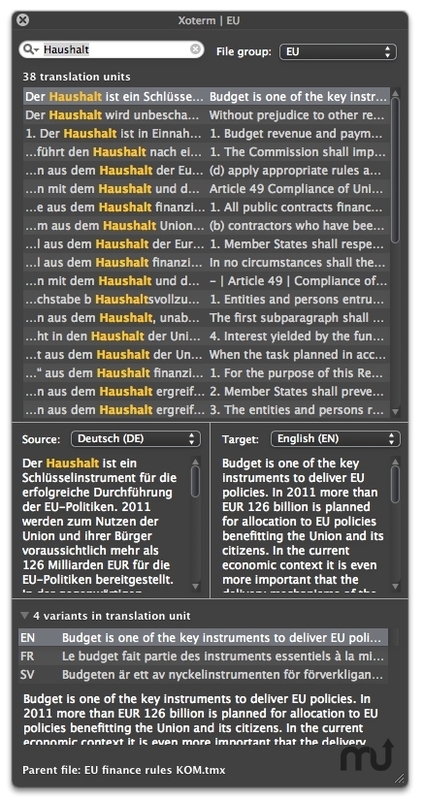 Xoterm is a viewer for TMX (Translation Memory Exchange) files. It displays a floating TMX reference panel with a search field, useful for professional translators who want to keep track of terminology. Users may create customizable TMX file sets for different translation assignment types. Xoterm integrates with some text editors for seamless lookup of selected text. Greatly speeded up TMX file parsing. Xoterm needs a review. Be the first to review this app and get the discussion started! Xoterm needs a rating. Be the first to rate this app and get the discussion started!